A British nurse receives the swine flu vaccine at the University College London Hospital in London. London, England (CNN) -- A mass H1N1 immunization program began in the UK Wednesday, with the country's health minister urging all priority groups to take up the vaccine. Health and social care workers are among those identified in the "priority" group given first access to the vaccine against the H1N1 virus, commonly known as swine flu. Others include pregnant women, those over 65, people with asthma, diabetes and those having cancer treatment, the country's Department of Health has said. From Monday, this group will be given appointments to visit doctors surgeries to receive the vaccine. The vast majority of people will be offered GlaxoSmithKline's Pandemrix vaccination, which is effective after one dose but made using chicken eggs, according to the Department of Health. Those allergic to eggs will instead be offered Baxter's Celvapan, which requires two doses three weeks apart. The Department of Health says that it has placed enough orders for the entire UK population of 60 million to be vaccinated against H1N1 swine flu. Health Secretary Andy Burnham said in a statement: "Our best line of defence against swine flu is the vaccine. I'm very pleased to say that the UK is one of the first countries in the world to start vaccinating against this virus." The country's National Health Service (NHS) staff , who have in the past been reluctant to take the seasonal flu vaccines, were urged to take the swine flu jab. Chief Medical Officer Sir Liam Donaldson said in a statement: "It's important for frontline health and social care workers to have the vaccine. "It will help prevent them and their families getting the virus from patients, it will stop them passing the virus onto their patients, it will potentially protect them from mutated strains and it will reduce the disruption to NHS services caused by people being absent due to illness." Nearly 400,000 people worldwide have contracted laboratory-confirmed cases of swine flu and more than 4,700 people have died from the illness since it was first identified in Mexico and the U.S. in April, World Health Organization said last week. A total of 228 deaths have been reported in Europe since April, according to the European Centre for Disease Prevention and Control. 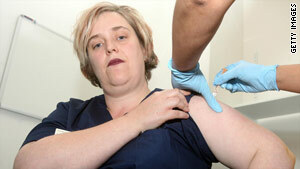 France started immunizing health-care workers against swine flu Tuesday. Germany will roll out its vaccine program next week and Ireland in early November, while Spain is expected to start vaccinating in mid-November.